Branson restaurants offer an experience of good food, relaxation and enjoyment. Many of our happy memories seem to be centered at the dinner table. It is not only the food it is a time with family and friends. Our pages will tell you of the variety and types of restaurants in Branson that you will find in the Branson area. Many of these restaurants serve an assortment of foods and can be classified in a variety of ways so our intent is to include the restaurant on the page we believe highlights their primary emphasis. Since you might classify them differently, we encourage you to look through each of these pages. Our purpose is not to do reviews since we feel that everyone has different tastes and is searching for something different. We may, however, add a comment when we have frequented an establishment and can offer some information on it. You might want to plan all your activities for a day to save travel time, so we have added a page listing these same restaurants by area. Country and down-home cooking is natural for the Ozarks. 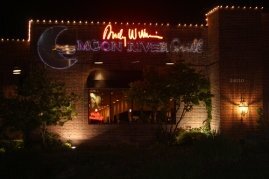 There are many of these restaurants in the Branson area. We have separated them as Buffet Restaurants and Family Restaurants . If you like a hearty breakfast, you may want to go to our Branson Breakfast page. We've also added our list of restaurants serving the finest in Sunday Brunches on this page. You will find many choices if you're looking for a nice steak. Our Steak Restaurants page has the full range from the medium priced to those elegant dining establishments. Most of these will feature other cuisine as well. Our Seafood Restaurants page duplicates a few of the Steak restaurants that highlight both and includes the restaurants featuring fish from the Ozarks lakes and streams.For that special evening many of these restaurants are also included on our page of Fine Dining Restaurants . Branson Restaurants provide an array of international cuisine and our Mediterranean Cuisine page features some wonderful Italian Restaurants and the delicious cuisine of the Greek Restaurant. If you're looking south of the border you'll find plenty of Mexican and Tex-Mex Cuisine on our Mexican Restaurants page. The Asian Restaurants page features oriental foods showcasing Chinese Restaurants, Japanese Restaurants, Korean Restaurants, Thai Cuisine and cuisine from Hong Kong. 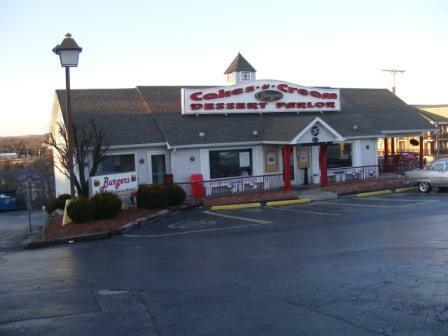 Among the favorite of the Branson Restaurants are the many Diners. Sprinkled throughout the area the Branson Diners bring a variety of food to the table as well as the small café and diner atmosphere. You will find these eateries serving a variety of foods, but they all have that small friendly feel that makes them a favorite place to relax with friends and family. Whether you want carry out or sit down, buffet style or cooked to order you'll find it at the Pizza restaurants in Branson. Pizza has become so common that it is in many Branson Restaurants and places like C-stores, dessert shops and of course Italian restaurants. We love BBQ whether it is Carolina style, Texas style, Kansas City or Memphis style, as long as it's smoked. Check our page on Barbecue Restaurants and try some while you're here. Sometimes we have a hankering for a simple American dining experience of burgers and dogs. Branson provides some of the best at these Burger Restaurants . Hamburgers are served in most Branson restaurants but we have compiled a list of our favorite burger and hot dog joints. Some of the best burgers and sandwiches can be found at various Bar and Grill restaurants throughout the area. Desserts and Snacks await at all the treat shops in town. In this list you will find bakeries, ice cream shops and candy stores. If you want some quick dining, there are Fast Food Restaurants Branson and throughout the area. Branson Missouri restaurants offer some great dining, so take your time, enjoy the atmosphere and most of all enjoy the people. For a quick reference to dining in each area of Branson check out our Branson Restaurant List by Area page. Our friends at lifestylebranson.com offer some in-depth reviews and news about some of the favorite restaurants in the Branson area. You'll want to check them out.